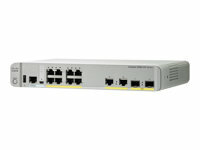 The Cisco Catalyst WS-C3560CX-8PC-S Compact Switch helps optimize network deployments. 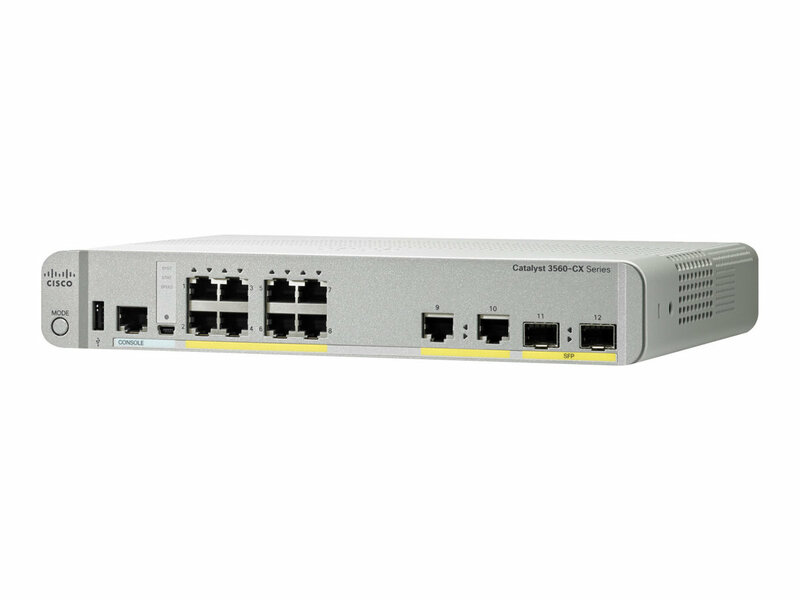 These Gigabit Ethernet (GbE) and Multigigabit Ethernet (mGig) managed switches are ideal for high-speed data connectivity, Wi-Fi backhaul, and Power over Ethernet (PoE+) connectivity in places where space is at a premium. With a single copper or fibre cable from the wiring closet, Cisco Catalyst compact switches enable IP connectivity for devices such as IP phones, wireless access points, surveillance cameras, PCs, and video endpoints. With their quiet, fanless design and compact footprint, these switches offer flexible mounting options and open up a variety of network design and connectivity options. Use them in offices, classrooms, hotels, retail stores, and other enterprise and branch locations. The setup allows for shorter cable runs from the compact switches, allowing for flexibility in space redesign and growth as new devices join the network - this eliminating the need for expensive and inflexible cabling infrastructure. With the enormous growth of 802.11ac and new wireless applications, wireless devices are driving the demand for more network bandwidth. This creates a need for a technology that supports speeds higher than 1 Gbps on all cabling infrastructure. Cisco Multigigabit Ethernet technology is a unique Cisco innovation that allows you to achieve bandwidth between speeds of 100Mbps and 10 Gbps over traditional Cat 5e cabling or above. In addition, the Multigigabit ports on the Cisco Catalyst Compact switch support PoE+, which is increasingly important for next-generation workspaces and Internet of Things (IoT) ecosystems. The Multigigabit Ethernet ports can also be used as uplinks to connect to traditional access switches such as the Cisco Catalyst 3850/4500 switches. Multiple speeds: Cisco Multigigabit technology supports autonegotiation of multiple speeds on switch ports. The supported speeds are 100 Mbps, 1 Gbps, 2.5 Gbps, and 5 Gbps on Cat 5e cable and up to 10 Gbps over Cat 6a cabling. Cable type: The technology supports a wide range of cable types, including Cat 5e, Cat 6, and Cat 6a or above. PoE power: The technology supports PoE and PoE+ for all the supported speeds and cable types.